Today was what I refer to as a curveball morning. Our girls commute to school. The school they attend is 35 minutes away, and our meet up spot is at a local Walmart. This morning we were running late, as usual, and I found myself going way too fast (you’ll notice this trend if you haven’t already) off the off ramp. 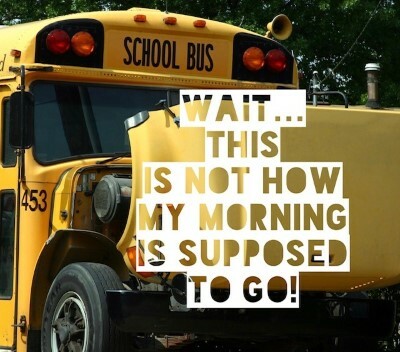 As we approach the off ramp, it’s routine that the girls make sure the other moms in minivans (who I am convinced never have curveball mornings) are still in the parking lot, that the bus hadn’t taken off without us (how are they ALWAYS on time!? ), and more often times than not, we find ourselves following the bus that final few yards to our bust stop. “The bus is broke down on the side of the road. The school is working on transportation, but it’s up to the parents to get the kids to school at this point.” I may have done my best to maintain eye contact while also doing my best to avoid breath contact. I mean, who needs that wake up call? My plan for the day flipped upside down as my brain ran circles around my agenda that was now nonsensical at best and impossible at worst. What was I going to do? I knew I needed to get home and get our son so my husband could get to work, and I wouldn’t be back soon enough to drop him off for preschool. I contemplated a “skip day” and figured that may just be my only option. I *was* my only option. The car beside us was another mom, driving a minivan. Bless her. Bless her so. She also heard the news of our morning options, and she had made up her mind to take her son to school. She tapped on my window offering to take our girls with her, and the girls hopped out of our car instantly. This mama, this precious gift from the heavens mama, probably thought she was just filling empty seats in her van, but honestly she was touching a frazzled and exhausted piece of my heart. Often times as moms we just do what needs to be done without complaint ( or as little complaint as possible). We go about our day with a checklist, we are the ultimate masters of multitasking, and very seldom ask for help. We just do it because it’s what we do, who we are, and what is necessary for a healthy, thriving family. So this morning got me thinking. Who do we as mothers have in our corner? Do we have one another to rely on? To rally with? To tap on windows for? I am a firm believer that raising our children takes a village, and this morning my village showed up. Whether offering to help transport a kid, dropping off a meal to a mom who has a lot on her plate, checking on a friend whose husband works out of town, or stepping into what God is asking you to do today, I urge you to do it! Make the call. Make the visit. Show up. I guarantee we all have a mom friend that could use our help at this very second, and they are just waiting for a tap on their window. Mindy..you are already there. You are one of the most caring, loving individuals I know. You amaze me when you tell of the activities you and Brian do with your own “kiddos” and include their friends. Your 28-hour day is full and overflowing with compassion for others…tapping on windows! Oh grammie. Thank you so much. So many days feel like we are just surviving, forget thriving. Your words mean so much! I love you! !